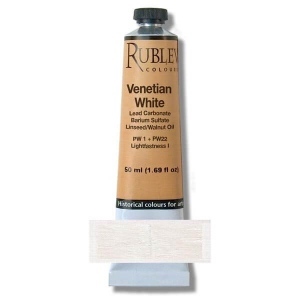 Rublev Colours Venetian White is a semi-opaque white ground in a blend of pale linseed and walnut oil that provides a stiff white, excellent for mixing with colors. According to Salter's edition of George Field's Chromatography (1869), Venetian white was a commercial name in the 19th century for a white pigment mixture composed of equal parts of lead white (basic lead carbonate) and 'heavy spar' (that is, the barium sulfate mineral barite or baryte). The names Venice white and Venice ceruse were also used for this mixture as well as for pure lead white. We've replicated this color for artists today without the fillers and stearates of modern whites. The white mineral barite has a lower refractive index than lead white, making it less opaque and hence well suited for mixing with other colors. Use it to make pale tints of colors without overpowering them or as a foundation for other colors. George Field. Chromatography; Or, A Treatise on Colours and Pigments, edited T. W. Salter. London, 1869. WARNING: POISONOUS! MAY BE HARMFUL IF SWALLOWED. Contains Basic Lead Carbonate. Avoid ingestion and skin contact. Wear protective clothing and gloves to prevent contact with broken skin. Never use near children or pets. Conforms to ASTM D 4236.